Children as Pedestrians | Nashville Car Accident Lawyers The Law Offices of John Day, P.C. Children travel as pedestrians every day—they walk to school, to friends’ houses, to parks. 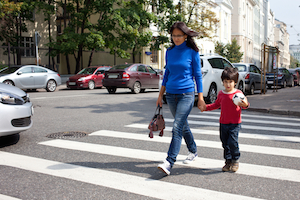 Just like adults, then, children are subject to the risk of pedestrian-automobile accidents. In fact, in 2011 approximately 16% of pedestrians injured in reported crashes were 14 years old or younger. For children, the effects of a pedestrian accident can be catastrophic. Children are at a higher risk of serious injury or death when hurt as a pedestrian due to their small size, limited ability to discern distances and speeds, and general lack of knowledge of traffic rules. For children under 14, almost one in four traffic deaths is a pedestrian death. Pedestrian injuries are the fifth leading cause of death for children ages 5-19 in the United States, and teenagers are especially at risk, with a pedestrian death rate twice that of younger children. How can these injuries and deaths be prevented? As drivers, adults should pay attention to all pedestrians, but special care should be taken in areas where children are likely to be present. School zones and neighborhoods are prime areas for child pedestrians. Drivers in school zones and neighborhoods should strictly obey speed limits, yield at crosswalks, and maintain constant vigilance to reduce the risk of accidents. Talk to your kids about safety when walking. Impress upon them that it is always best to walk on sidewalks or paths. Teach your kids that it is safest to cross streets at street corners, and when a crosswalk or traffic signal is available it should be utilized. When crossing a street, kids should look left, look right, then look left again to be sure the roadway is clear of cars. Begin teaching kids at an early age to put down their devices when walking on or near roadways. Many children these days are constantly connected to phones and music devices, and distracted pedestrians are far more likely to be injured in a collision. Younger kids should not cross streets without an adult. Generally, children under 10 will have difficulty judging the speed and distance of cars. Hold your child’s hand when crossing the street. Tell children to make eye contact with drivers before crossing the street. Remind children to always look out for cars that are turning or backing up, especially in parking lots and driveways. Teach kids to stop at the edge of all parked cars and curbs to ensure they can proceed safely. Praise your child when you see him or her practicing safe pedestrian actions. If your child has been injured in a pedestrian accident, we understand you are likely overwhelmed with the physical, emotional and financial consequences of the accident. But, please remember that your claims against the driver are likely subject to certain time limits. If you would like to discuss your case for free and without obligation, call us at 615-742-4880 or toll-free at 866.812.8787. Our award-winning attorneys will review your case in a free, no-obligation consultation, and we handle all pedestrian accident cases on a contingency basis so it will cost you nothing out of pocket to pursue your child’s legal rights.